The emotional end can be so difficult that it’s hard to look at every angle of the divorce, but we’ve seen that it’s necessary to get that piece of it figured out in its entirety. RoadFish.com men’s lifestyle and finance magazine today released their observations and experience with the different ways divorce can have a negative impact on credit. Their contribution may help recent divorcees due to the current high divorce rate in the United States and the harmful affect that the ramifications of divorce can have on both parties’ credit scores. MSN Money partner Rob Berger reported that although divorce itself will not show up on either party’s credit history, there are implications from a divorce that can have an unpleasant affect on reports and scores. Berger reported that there are many different areas of debt that a married couple can share, such as a mortgage, car loan, and joint credit card, and all of their debt is linked unless certain steps are actively taken to undo the union. The article states that for instance if a couple owns a car together, the way to get one party’s name off of the loan is to refinance the vehicle in the responsible spouse’s name. Otherwise, they are both technically responsible for all payments. Mortgages are reportedly more complicated, but the general rule of thumb is that if, after a divorce, one spouse continues to live in the home then both parties are accountable for the mortgage. According to Divorcerate.org, the commonly quoted statistic that 50% of marriages end in divorce is not entirely accurate, but is quite close to reality. The website, which keeps tabs on the divorce rate both nationally and internationally, gives numbers broken down by age. For instance, of women who are under 20 years old that get married, 27.6% will get divorced versus 11.7% for men of the same age. Women between the ages of 20-24 years old who get married have a 36.6% rate of divorce, and men of the same bracket have a 38.8% divorce rate. There is also a discrepancy between whether a divorce comes from a first, second, or third marriage. According to the website’s statistics, for a first marriage the divorce rate is 41%, for a second marriage it is 60%, and for a third marriage the divorce rate jumps to 73%. Guest journalist Rob Berger, who wrote the above-mentioned article, is an avid finance blogger and the founder of Dough Roller, a personal finance blog. In his articles and blogs, Berger offers advice, hints, and obscure but helpful financial facts that may be advantageous for readers to be made aware of. According to a bio posted on HR Block, where Berger has blogged before, Berger will do a test-run on a new article he has written by answering the question of whether the article would be useful to his teenaged children at home when they begin to manage their personal finances on their own. 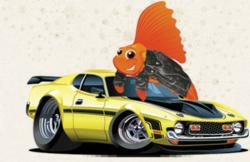 RoadFish.com men’s lifestyle and finance magazine today commented on how a divorce can take a toll on one’s credit. These observations may prove helpful to U.S. divorcees by providing enlightening and critical information about finances and credit history. RoadFish.com is a heavily-read online men's magazine that includes lifestyle, personal finance, travel, and current events topics. Most RoadFish.com readers are men in their 30's and 40's, who have generally already achieved a great deal of success and are striving towards a bigger goal. RoadFish.com men’s lifestyle and finance magazine features articles about men's luxury items, hot chicks, divorce tips, food and hotel reviews, and new information about student loans and debt. It is owned and operated by Purpose Inc.